The 2004 NASCAR Nextel Cup season was the 56th season of professional stock car racing in the United States and the 33rd modern-era Cup series season. The season began on Saturday, February 7, and ended on Sunday, November 21. Kurt Busch with Roush Racing driving a Ford was the Nextel Cup champion. This was the first season that NASCAR utilized the Chase for the Nextel Cup format that began with the Sylvania 300 on Sunday, September 19. Under the format rules, the top 10 drivers (and any additional drivers within 400 points of the leader) by the end of the 26th race would be eligible to compete in a final 10-race playoff to determine the NASCAR Nextel Cup champion. Following the 26th race, the eligible drivers would have their points reset to bring the drivers closer together in the standings, with only five points separating each driver. The season would then continue as normal, with the driver with the most points at the end of the season becoming the champion. The NASCAR Manufacturers' Championship was won by Chevrolet when they captured 26 wins and 266 points. Ford finished in second place with 10 wins, and 224 points, while Dodge followed in third with 4 wins and 194 points. This was the first year for the new series sponsorship. Mobile phone provider Nextel assumed sponsorship of the NASCAR championship series from cigarette brand Winston. Winston was the title sponsor of the Cup Series for 33 seasons, from 1971 to 2003. Nextel would become only the second title sponsor in Cup Series history. This was also the first year for Sunoco as it replaced Unocal's 76 Brand as the official fuel of NASCAR. Sunoco would become only the second gas company to be NASCAR's official fuel, since Unocal had been the official fuel since the sport's inception in 1948. The season was also marked by tragedy. On October 24, a charter airplane owned by Hendrick Motorsports crashed at Bull Mountain in the Blue Ridge Mountains of Virginia, near Martinsville Speedway. Ten people aboard the plane died, including four relatives of team owner Rick Hendrick, as well as Randy Dorton, Hendrick's chief engine builder. Jimmie Johnson, a Hendrick driver, had won the race, but the post-race victory ceremony was cancelled as word spread of the incident. Evernham Motorsports 9 Kasey Kahne (R) Tommy Baldwin Jr. The exhibition Budweiser Shootout was held on February 7 at Daytona International Speedway. The Gatorade 125s qualifying for the Daytona 500 were held on February 12 at Daytona International Speedway. Greg Biffle won the pole. The final Subway 400 was held on February 22 at North Carolina Speedway. Ryan Newman won the pole. This was the final NASCAR race held at Rockingham, which was dropped from the 2005 NASCAR schedule following the Ferko lawsuit and declining attendance. During the race Carl Long went for a wild tumble down the back straight and Robby Gordon was turned into the wall and got on his side. The race also became the beginning of the focus of the season-long field-filler controversy. Joe Ruttman arrived at the track without a pit crew for a start and park, Andy Hillenburg was involved in a crash after running slow, and Kirk Shelmerdine was black-flagged for failing to maintain a minimum speed. NASCAR added a mandate of a full pit crew in an attempt to stop the start and park. NASCAR also announced, in light of the Super Bowl XXXVIII halftime show controversy, at the drivers' meeting that a points penalty would also be assessed to anyone involved on a race team who uses inappropriate language. Previously, a fine had been assessed. The UAW-DaimlerChrysler 400 was held on March 7 at Las Vegas Motor Speedway. Kasey Kahne won the pole. Kyle Busch made his NASCAR debut, finishing 41st. The finish saw Matt Kenseth score his second win in a row, as Kasey Kahne once again finished second. The Golden Corral 500 was held on March 14 at Atlanta Motor Speedway. Ryan Newman won the pole. The Carolina Dodge Dealers 400 was held on March 21 at Darlington Raceway. Kasey Kahne won the pole. This was the last 400-mile race held at Darlington. The Food City 500 was held on March 28 at Bristol Motor Speedway. Ryan Newman won the pole. This was Kurt Busch's third straight win in a Cup event at Bristol, and third straight spring Bristol win. This marked the final race ever for Pontiac to be in a NASCAR event. Hermie Sadler drove the 02 car for Pontiac's final ever race. The Samsung/Radio Shack 500 was held on April 4 at Texas Motor Speedway. Bobby Labonte won the pole. Elliott Sadler edged out Kasey Kahne by a .028 of a second. This was the last race attempted for Pontiac in the series. Andy Belmont failed to make the race. Carl Long, Andy Belmont, and Hermie Sadler however, did run a combined 4 races (which all 4 races were consecutive) in a Pontiac at the beginning of the season, driving the number 02 car for Sadler Brothers Racing, a single car team. Carl Long raced the car at Las Vegas, then the next 2 weekends, Andy Belmont raced at Atlanta and Darlington, and finally, one week later, Hermie Sadler raced at Bristol. The Bristol race marked the final race ever for Pontiac, and those 4 races would be the final 4 races for Pontiac in NASCAR. Andy Belmont attempted Rockingham in February along with this race, but failed to make both events. After failing to make this race, Pontiac left NASCAR for good. Pontiac leaves the sport with 3 Manufacturer's Championships (1961, 1962, and 1993), and scoring 154 Career NASCAR wins. Rusty Wallace is the all time winner in a Pontiac at 31. Only 4 drivers have won the Series Championship driving a Pontiac: Joe Weatherly (1962 and 1963), Rusty Wallace (1989), Bobby Labonte (2000), and Tony Stewart (2002). The Advance Auto Parts 500 was held on April 18 at Martinsville Speedway. Jeff Gordon won the pole. On lap 284, the concrete pavement in turn 3 broke up, creating a pot hole. Jeff Gordon would run into the broken up part of the track, damaging his race car. The race was red flagged to repair the track, and while NASCAR would not grant the 24 team's request to be able to repair the car during the red flag, Gordon was able to fight back in the second half of the race for a sixth-place finish. Rusty Wallace broke a winless streak of 106 races, dating all the way back from April 29, 2001, at Auto Club Speedway. This would be the 55th and final career win for Rusty Wallace. With this win, he passed Lee Petty on NASCAR's win list. The Aaron's 499 was held on April 25 at Talladega Superspeedway. Ricky Rudd won the pole. The race ended under controversy when Brian Vickers crashed with four laps to go. At the same time, Jeff Gordon was about to be passed by Dale Earnhardt, Jr. As Gordon's car was still ahead of Earnhardt's, he kept the lead for the following caution. However, the race never was restarted, and Gordon won the race under the caution, prompting angered fans to throw beverage cups at his car while he celebrated his victory by doing doughnuts on the track. The issue was very similar to the 2002 Indianapolis 500 controversial finish when Hélio Castroneves and Paul Tracy raced when the caution signal was given during Tracy's attempted pass of Castroneves. This led to the implementation of the green-white-checker finish rule in order to avoid such situations in the future. The event marked the last career pole for Ricky Rudd. The Auto Club 500 was held on May 2 at California Speedway. Kasey Kahne won the pole. The race marked the 19th time in his career that Jeff Gordon won back-to-back races. The Chevy American Revolution 400 was held on May 15 at Richmond International Raceway. Brian Vickers won the pole. The Nextel Open was held on May 22 Lowe's Motor Speedway. Dave Blaney won the pole. Sterling Marlin and Ken Schrader advanced to the All-Star challenge after this race; Marlin for winning the race, and Schrader for winning the fan vote. The Nextel All-Star Challenge was held on May 22 at Lowe's Motor Speedway. Rusty Wallace won the pole. The Coca-Cola 600 was held on May 30 at Lowe's Motor Speedway. Jimmie Johnson won the pole. Jimmie Johnson won this race in dominating fashion, as he led 334 of the race's 400 laps. The MBNA America 400 "A Salute to Heroes" was held on June 6 at Dover International Speedway. Jeremy Mayfield won the pole. The race snapped a 73-race winless streak for Martin that had been going on since Charlotte in May 2002. The race was decimated by a 20-car crash on lap 347 on a restart; one of the largest crashes ever outside of Daytona and Talladega. It started when Dave Blaney was hit by Michael Waltrip. The Pocono 500 was held on June 13 at Pocono Raceway. Kasey Kahne won the pole. This race ended under caution. The DHL 400 was held on June 20 at Michigan International Speedway. Jeff Gordon won the pole. Kasey Kahne got his fourth second-place finish of the season. The Dodge/Save Mart 350 was held on June 27 at Infineon Raceway. Jeff Gordon won the pole. The Pepsi 400 was held on July 3 at Daytona International Speedway. Jeff Gordon won the pole. The start of the race was delayed more than 30 minutes due to rain and the race started under yellow to help the track dry from the rain. 8 cars sported Coca-Cola C2 liveries, which were driven by John Andretti, Greg Biffle, Tony Stewart, Ricky Rudd, Kevin Harvick, Kurt Busch, Bill Elliott and Jeff Burton. This was the second Pepsi 400 televised by Fox. This race marked the 20th time in his career that Jeff Gordon won back-to-back races. The Tropicana 400 was held on July 11 at Chicagoland Speedway. Jeff Gordon won the pole. This race is known for a pit road fight that occurred between crew members of Kasey Kahne and Tony Stewart after Stewart spun Kahne, causing a crash that also collected Dale Earnhardt, Jr., John Andretti, Dave Blaney, Jeff Burton, and Scott Riggs. All of the pit crew, crew chiefs and owners of the #9 and #20 were fined $50,000 for their actions. Stewart was not penalized. Jeff Gordon won the pole for the 4th consecutive race. This was the first time since Darrell Waltrip in 1981 that a driver won 4 consecutive poles in a season. The Siemens 300 was held on July 25 at New Hampshire International Speedway. Ryan Newman won the pole. The Pennsylvania 500 was held on August 1 at Pocono Raceway. Casey Mears won the pole. This was the second straight race that Dale Earnhardt Jr. was replaced by John Andretti after Martin Truex Jr. at Loudon one week earlier because he suffered second- and third-degrees burns on his neck, chin, and legs from a burning car during the practice for the American Le Mans Series Grand Prix of Sonoma at Infineon Raceway and prevented him from finishing the race at Loudon and Pocono. The Brickyard 400 was held on August 8 at Indianapolis Motor Speedway. Casey Mears won the pole. 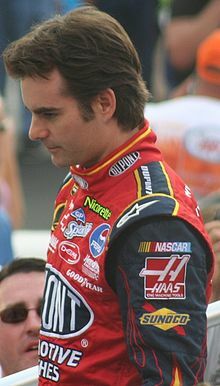 Jeff Gordon had become the first 4 time NASCAR winner at the Brickyard, and the only driver to do so until Jimmie Johnson in 2012. Gordon would join A.J. Foyt, Al Unser, Sr., and Rick Mears as the only 4 time winners in the entire history of Indianapolis Motor Speedway. This race marked the first time that the green-white-checker finish rule came into play. The race was extended after Brian Vickers and Ryan Newman crashed on lap 158. However, when Ricky Rudd crashed on lap 160, the race still ended under caution. Last career top 10 finish for Bill Elliott. The Sirius at The Glen was held on August 15 at Watkins Glen International. Jimmie Johnson started on the pole after qualifying was rained out. Tony Stewart put up a spectacular race, narrowly beating Ron Fellows for the win. Ron Fellows matched his best career finish in a Cup series race after starting 43rd in the race. This was Burton's final start for Roush Racing before moving to Richard Childress Racing at Michigan the following week after he signed a three-year contract with Richard Childress Racing just before the race at Watkins Glen. Carl Edwards would take over the 99 car the following week, while Burton would move to the #30 RCR entry for the remainder of the season before taking over the #31 entry at the start of the 2005 season. The GFS Marketplace 400 was held on August 22 at Michigan International Speedway. Jimmie Johnson started on the pole after qualifying was rained out. All five Roush Racing cars finished in the top 10. This was Carl Edwards' first start in the Nextel Cup Series. The Sharpie 500 was held on August 28 at Bristol Motor Speedway. Jeff Gordon won the pole. The inaugural Pop Secret 500 was held on September 5 at California Speedway. Brian Vickers won the pole. Portions of this race were filmed for the movie Herbie Fully Loaded. Kasey Kahne got his fifth second-place finish of the season. The Chevy Rock and Roll 400 was held on September 11 at Richmond International Raceway. Ryan Newman won the pole. This race was a notable when Jeremy Mayfield gained five positions from 14th to 9th and clinched the spot in the Chase. The Sylvania 300 was held on September 19 at New Hampshire International Speedway. Despite the rain washing out the qualifying, the starting lineup was set by owner's points, and Jeff Gordon started in the front row. This was the first race of the new 10-race playoff format. The MBNA America 400 was held on September 26 at Dover International Speedway. Jeremy Mayfield won the pole. Ryan Newman ran away with the win in this race, leading 325 of 400 laps and winning by a margin of 8.149 seconds. The EA Sports 500 was held on October 3 at Talladega Superspeedway. Joe Nemechek won the pole. At the finish line, on the last lap Elliott Sadler flipped over just as he had done in the same race in 2003. He was uninjured, though. Although he won the race, Dale Earnhardt, Jr., was later penalized 25 points for uttering an obscenity during his post-race interview on NBC. This was the first play-by-play appearance for Bill Weber, due to Allen Bestwick's injury during a hockey match. The Banquet 400 Presented by ConAgra Foods was held on October 10 at Kansas Speedway. Joe Nemechek won the pole. This would be the 4th and final career for Joe Nemechek. As of 2018, Nemechek is the only driver to score every single win with every different team. His 1st career win was in the 42, driving for SABCO Racing at Loudon in 1999. His 2nd career win was in the 33, driving for Andy Petree Racing at Rockingham in 2001. His 3rd career win was in the 25, driving for Hendrick Motorsports at Richmond in 2003. Finally, his 4th and final career win was in the 01, driving for MB2 Motorsports in this race at Kansas. The one thing in common with all 4 different teams however, was that all 4 wins were in a Chevrolet. The UAW-GM Quality 500 was held on October 16 at Lowe's Motor Speedway. Ryan Newman won the pole. The Subway 500 was held on October 24 at Martinsville Speedway. Ryan Newman won the pole. Victory lane celebration was cancelled after a tragic plane crash that took the lives of key personnel in the Hendrick Motorsports stable. The Bass Pro Shops MBNA 500 was held on October 31 at Atlanta Motor Speedway. Ryan Newman won the pole. 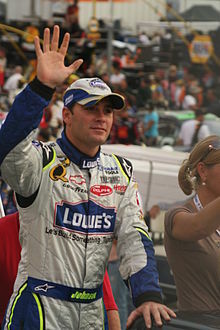 Johnson won the race just one week after a plane crash that killed ten people involved with Hendrick Motorsports including Rick Hendrick's son Ricky. The four Hendrick teammates drove a special paint scheme for the remainder of the season to honor those involved in the crash. Johnson became the first driver since Jeff Gordon (last 2 races in 1998 and the 1999 Daytona 500) to win 3 races in a row. The Checker Auto Parts 500 was held on November 7 at Phoenix International Raceway. Ryan Newman won the pole. Race extended to 315 laps / 315 miles due to green-white-checker finish. The race at Phoenix was very cloudy and a short chance of rain in a cold weather. After two straight 33rd-place finishes at Martinsville due to blown engine and Atlanta due to accident on lap 310, Dale Earnhardt Jr. won the race for the sixth time in this season that puts Earnhardt Jr. from fifth to third in the points standings with two races left in this season. The Mountain Dew Southern 500 was held on November 14 at Darlington Raceway. Qualifying was cancelled due to rain and the starting lineup was set by owner's points. Kurt Busch was the points leader and sat on the front row. Jimmie Johnson completed a sweep at Darlington while Tony Stewart and Ryan Newman were eliminated from Chase contention by being greater than 156 points behind the points leader. With this win, Jimmie Johnson became the first driver since Bill Elliott in 1985 to pull off the season sweep at 3 different tracks in one season. Along with Darlington, he pulled off season sweeps at Pocono and Charlotte. Elliott is the only driver in NASCAR history to pull off the season sweep at 4 different tracks in one season, with the tracks being Pocono, Michigan, Darlington, and Atlanta. In victory lane Busch honored his championship win to the Hendrick family because of the plane crash three weeks prior, at the Martinsville race. Kurt Busch would become the 6th different champion in the last 6 years, a NASCAR Modern Era record. The Rookie of the year battle in 2004 marked the first time since 1998 that a rookie driver did not visit victory lane. The winner of the battle was dark horse candidate Kasey Kahne, who went from a 41st-place finish at the season opening Daytona 500, to being narrowly defeated by Matt Kenseth the next week at Rockingham, and he never looked back, grabbing fourteen top ten finishes and thirteen top-five finishes, as well as a couple of pole positions. Pre-season favorites Scott Wimmer and Brian Vickers struggled, although Wimmer placed third in the Daytona 500, but neither made competitive strides during the season. Brendan Gaughan was a pleasant surprise, posting four top tens and finishing runner-up to Kahne for the award, while Scott Riggs only had two-top ten finishes. The only other rookie, Johnny Sauter, was released from his ride mid-season and never made a challenge for the top honor. ^ "Standings: 2004 Manufacturer Standings". NASCAR; Turner Sports and Entertainment Digital Network. Retrieved September 12, 2009.